The crisis facing the world’s transportation, energy and water/wastewater infrastructure has been thoroughly documented, most recently in the USA-focused Making the Grade report. In keeping with the spirit of the Making the Grade report’s push to go beyond citing problems to offering concrete solutions, Autodesk’s Excellence in Infrastructure Competition seeks to highlight extraordinary examples of practical, cost effective and inspiring solutions that show how the latest in technology can make a profound difference. That’s the motivation behind the Autodesk Excellence in Infrastructure Competition, now in its third year. Sponsored by Autodesk, Inc. and hosted by CGarchitect, a leading online magazine and end-user community for visualization and design professionals, each winner demonstrated an exemplary use of Building Information Modeling (BIM) for civil infrastructure. 1st Place: Huettenwerk Krupp-Mannesmann (HKM) – “One Digital Factory” project, Duisburg, Germany. 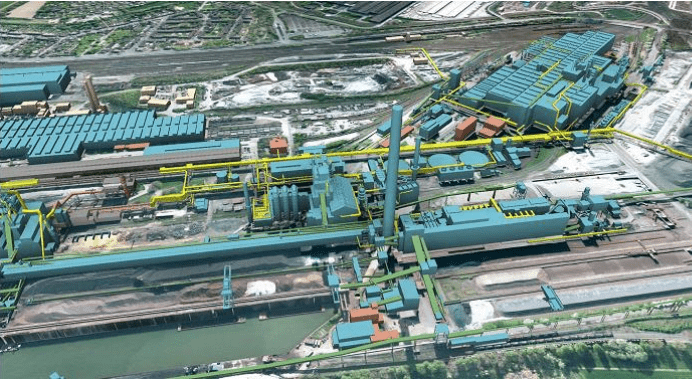 HKM captured first place with the creation of a comprehensive 3D model of a factory, including 3D-Scans and aerial photogrammetry of the factory, and the creation of a 3D model of the factory and surrounding environment within Autodesk InfraWorks. With this model they are able to reduce redundancy and contradictory 2D and 3D data, which helps to boost productivity in design and planning processes, reduce lead times for decision-making, and optimize inventory. Click here for more information. 2nd Place: Dewberry & Loudoun Water – Potomac Water Supply Program Visualization, Loudoun County,Virginia, USA. To effectively communicate the mission of the Potomac Water Supply Program, Dewberry used Autodesk design and visualization tools [including Autodesk InfraWorks] to assist in the development of a community outreach video for the program, communicating how the program is designed to protect the Potomac River by using an innovative water banking system. Click here for more information. 3rd Place: Huitt-Zollars and Orange County Public Works – La Pata Gap Closure, Orange County, California, USA. Huitt-Zollars used AutoCAD Civil 3D to significantly reduce the cost of a road project inSouthern California, and Autodesk InfraWorks helps the design firm communicate with and update stakeholders during the construction on the project. Click here for more information. Small Projects Award: Anchorage Municipal Light and Power 3D modeling of underground facilities,Anchorage, Alaska, USA. Using a camera and Autodesk ReCap 360, ML&P’s Locates, Engineering, andOperations personnel are creating 3D models of hard-to-access underground electrical vaults. These 3Dmodels are then made available to utility personnel through Autodesk ReCap 360 out in the field or backin the office. Click here for more information. Special Visualization Award: COWI and the Norwegian Public Roads Administration – E16 HighwayProject, Oslo, Norway. COWI uses a 3D model, created with Autodesk InfraWorks 360, of existing geographical conditions connected to the cloud, to plan and visualize the new E16, a four-lane, 32 km long highway in the east of Norway. Click here for more information. GRAFF3D’s Opera District project in Dubai and Polo Audiovisual project in Puerto Madero, Argentina. Atkins Consultants Ltd.’s M4 Elevated Section Management Strategy and Strengthening Trial project, Chiswick, West London. China Railway Eryuan Engineering Group’s Sichuan Xicheng Railway Passenger Dedicated Line project in Jiangyou City, Sichuan Province, China. The competition’s jury of industry experts selected the winners from submissions covering a wide range of transportation, land development, urban planning, water/wastewater and energy related projects. Entries were judged based on complexity, innovative use of technology, sustainability factors and the overallvalue Autodesk software and BIM for Infrastructure provided to the project outcome, whether used toplan, design, build or manage infrastructure projects. The winners will be honored at the upcoming Autodesk University 2014 conference – Infrastructure Symposium session this December in Las Vegas,and will be given more than $10,000 in prizes by competition sponsors including HP.